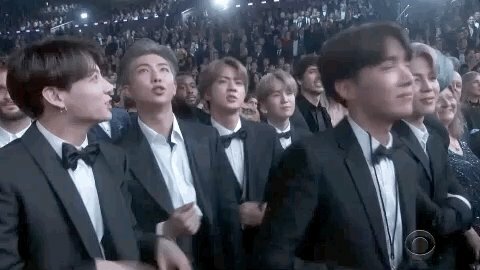 GIPHY's tweet - "BTS loving the Dolly tribute is EXACTLY what I needed to see rn 🙌🙌🙌🙌🙌 #GRAMMYs #GRAMMYs @RecordingAcad @DollyParton @BTS_twt #BTS "
#GRAMMYs @RecordingAcad @DollyParton @BTS_twt #BTS"
I WASNT ABLE TO TAKE VIDEO OF THIS COZ I WAS SO HAPPY THAT I SCREAMED & JUMPED!! SEEING THEM JAMMING ON "JOLENE" MAKES ME SO HAPPY!! "BTS amando o tributo à Dolly é EXATAMENTE o que eu precisava ver agora." Merhaba bunu ömrüm boyunca alnıma yapıştırıp gezeceğim teşekkürler. The gif everyone’s dying to have! Get it Jungkook!